We (those who develop software) still argue over coding standards. I do not refer to meaningful discussions over clarity, readability or group/project management. I mean crazy, ranting and aggressive behaviour towards one another over a ‘trivial’ matter. If you work at a place with a compelling reason to adopt a style, adopt it and join in on constructive discussions about its use at the appropriate time. If you have a personal preference, then apply it consistently and bask in the loveliness of your own code. I do not think code standards are trivial and pointless. I think they are important and create clarity. I think arguing about code standards is unimportant. Actually, I think arguing about code standards is more than unimportant, I think it can be destructive for communities in general. It really does not matter what the requirements are, we have programs to format source code at the speed of a key stroke. That list is not exhaustive, there are many other code standards to consider and they are usually related to various application frameworks. Big choices, big decisions – so big that I can configure my IDE of choice (PhpStorm) to convert my source code to any of them, almost instantly. I can also configure hooks to format code according to a project specifications, which can even be done automatically before commits. Unless you are pair-programming and decide on a mutually acceptable standard, code in whatever standard you like and simply convert it for your needs. Why argue? Get along with each other and create software instead; you might even catch yourself smiling more! Agile Staffordshire is running at Staffordshire University this month. It has been difficult finding a regular location recently, but Staffordshire University has some excellent facilities to host a good evening of software development topics. April’s meeting will be of particular interest to me as it is introducing Ruby, a language I have yet to use seriously. I am really looking forward to it. In summary, the meeting will be at Beaconside Campus in Stafford and will start at 19:00 in K102, The Octagon. Full details of the evening are available on the Agile Staffordshire Blog. I hope to see people there. LESS is a neat library that extends CSS with dynamic behaviour. It is not the only tool of its type but I like it as it is fairly quick to configure. I tend to build HTML projects as a quick front end to some code. LESS gives me a quick way of making changes to style. PhpStorm 6.0 provides file watchers that run LESS in the background and compiles CSS while you work. This very brief tutorial will help you get things going on Mac OS X Mountain Lion. Once npm is installed, open a terminal window and run the following command to install LESS. If you experience problems during the installation, my security options required sudo to be used and that allowed the installation to proceed, it may be the case for you too. Once the installation has completed, confirm the presence of lessc using which. Try it out by passing a simple .less file through the compiler. You should be good to go with LESS. 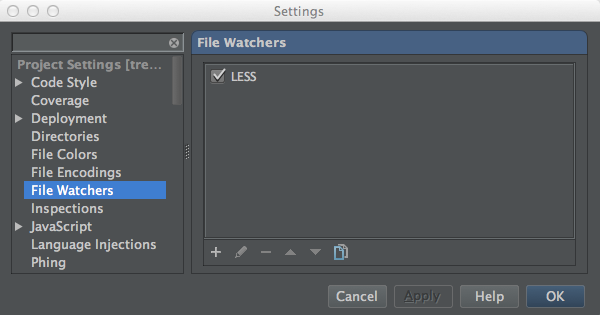 File watchers are a great feature in the JetBrains web IDEs. As you edit LESS files, Php/WebStorm will automatically compile them and produce CSS files in your project. You may get prompted to add a file watcher when editing a LESS file. Responding affirmatively is the simplest way of enabling the file watcher. If you missed it, select Preferences from the application menu. Select File Watcher from the ‘Project Settings’ section. If you responded to the auto-detect LESS prompt, there will be a file watcher already listed, as shown in the screen shot. If you are configuring for the first time, select the + icon and choose LESS. Editing file watcher settings using PhpStorm 6.0. PhpStorm should detect the installation of lessc automatically. Additionally, there are some useful settings in the dialog. The ability to track root files only is great when working with Twitter Bootstrap projects; when you only desire bootstrap.less to be compiled in response to changes in variables.less. A full description of the options is available in the JetBrains documentation. That is all there is to it. Any time you edit a LESS file, the IDE will compile it using the settings configured in the file watcher. LESS – the dynamic style sheet language. node.js – platform built on Chrome’s Java runtime. 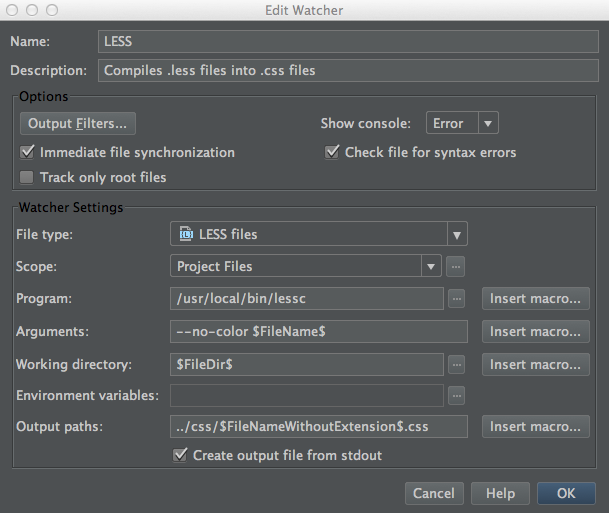 File Watchers – JetBrains web IDEs.